The roofing over one’s home can be damaged by certain factors over time. Extreme weather conditions, for example, can cause roofing materials to develop blisters and cracks. Once shingles begin deteriorating, moisture will start to form pools and the wooden structure beneath it will start to crack. Roofing materials near vents or chimneys are prone to corrosion while strong winds could lift them during storms and hurricanes. Remember though: you’ll need the right roofing contractors for the job. Whether you need a new roof, or just need repairs, this is the peak time to get the job done. Just be careful about which roofer you choose to do the work, because virtually anyone can call themselves a roofer. Unfortunately, homeowners often make the same mistake when they hire contractors to work on the home they’re still living in. So whether you need a brand new roof or just repairs, do your homework. Make sure the contractor is licensed and bonded and check for customer reviews and complaints. 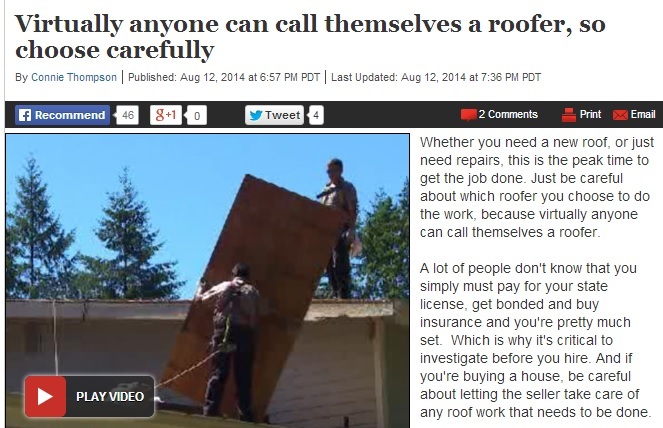 Remember—virtually anyone can hang a shingle and call themselves a roofer. And remember, the lowest bid doesn’t necessarily mean you’re getting the best work, but the highest best doesn’t guarantee the best work either. Finding a reputable roofing contractor in Sunnyvale means doing a background check. Consider the number of years the company has been in the roofing business. Get referrals from its former customers and check reviews made about the company. After all, nothing is better than testimonials from those who’ve already taken advantage of their services. If a roofing company has been in the business for many years then its quality of work should also be commendable. Remember that the most expensive repair that most homeowners have to deal with is repairing or replacing damaged roofing. Reputable roofers should also be able to provide quality roofing materials and repair work. Repairing damaged roofing can extend its estimated 15-20 year lifespan without getting a costly replacement. Getting repairs for damaged roofing in most cases is done on an emergency basis. A roofing company that handles emergency cases- whether they involve leak repairs, gutter repairs, and others- should be given much consideration. If you are interested in hiring a reputable roofing company that also does emergency roof repair in Sunnyvale, businesses like Shelton Roofing stand ready to fulfill your needs.